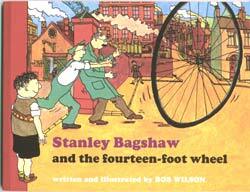 Stanley Bagshaw and the Fourteen foot wheel. 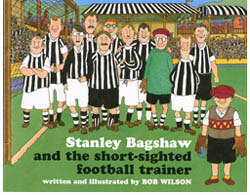 Stands in a class of it's own..
Bang on target for the six to eight year olds. The pictures are wonderfully varied and have in the quality of the painting, a touch of Tin Tin. It's difficult not to laugh out loud. Good, nostalgic, Northern fun....Genuine wit is the magic ingredient. The text demands to be read aloud....should delight readers and listeners of seven to ten years. We love this book. 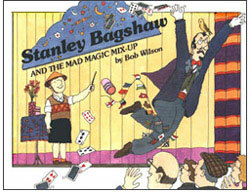 It's one of the true classic children's picture books. Thank goodness it is back in print - our local library's copy is worn out. Ideal for struggling new readers. Written in wonderful rolling verse which reads aloud beautifully. 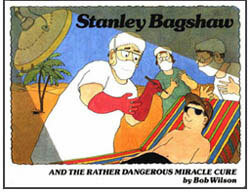 This book shows what a good vehicle strip cartoon can be. 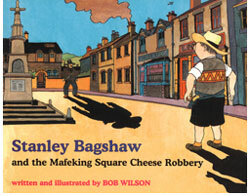 C.B.F Children's Book of the Year. 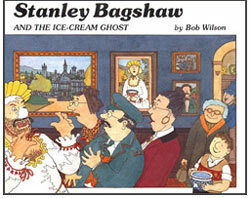 Another splendid Stanley Bagshaw story. In the final frames a radio broadcasts a critic's review of the book. :- "The use of idiomatic language, the pleasingly pedantic quatrains, full of lambent alliteration, coupled with deceptively naive illustrations..." I couldn't have put it better myself. Incredibly it's all true. Surpasses previous titles for inventiveness and wit. Kurt Maschler Award - Short listed. Full of wonderful ribald humour - we all roared with laughter! An irresistible book with humour crammed into every page. Strongly recommended. You'll be glued to every page so as not to miss a detail in the illustration or a snippet of wit in the text. Another hilarious adventure featuring the world's most unassuming hero. For Stan's newest volume - you ought. Here's one you'll be glad that you bought. 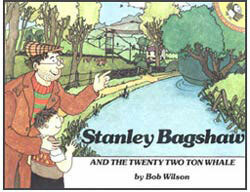 Young readers will just love the illustrations. It's full of action packed fun. Adults should get hold of this one before the kids do. It's very funny.